The Liquid Separations business of The Dow Chemical Company, of Midland, Mich., announced the availability of the Filmtec SW30HR-320 High Rejection Seawater Reverse Osmosis Element. 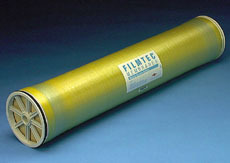 The element is designed for systems used to purify seawater sources such as open intakes, where there is a very high potential for fouling of the membrane. Conservatively rated at 99.6 percent salt rejection under Filmtec’s standard test conditions, the element delivers the highest quality potable water.